SpaceX wants to launch satellite internet in 2019 with initial test to be carried out by the end of this year, according to a hearing at the Senate in Washington. Elon Musk's company plans to release more than 4,000 satellites into orbit in instalments between 2019 and 2024. The plans will increase the number of satellites in space by 300 per cent and will create worldwide internet that could offer speeds of up to one gigabit per second - which is around 100 times faster than current home broadband. In a Senate hearing on US Broadband infrastructure, the SpaceX vice president of government affairs, Patricia Cooper, revealed that the company wanted to launch their operations in 2019. The network of satellites could provide 'fiber-like' speeds for a large area, according to Ms Cooper. 'The system is designed to provide a wide range of broadband and communications services for residential, commercial, institutional, governmental and professional users worldwide,' SpaceX wrote in its application. The documents, which include technical details of the proposed network, did not mention cost estimates or financing plans. Financial backers of the company include Alphabet's Google Inc and Fidelity Investments, which together have contributed $1 billion (£0.8bn) to Musk's space launch firm. According to a database by the Union of Concerned Scientists, there are 1,419 active satellites currently orbiting Earth, so SpaceX's fleet would make it five times bigger. 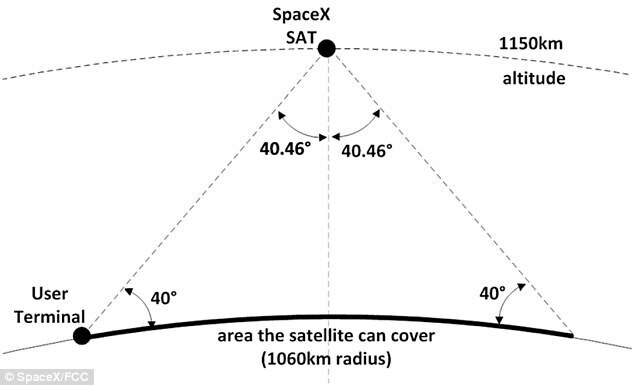 Each satellite in SpaceX's planned group will weigh about 850 lbs (386 kg) and be roughly the size of a Mini Cooper. They will orbit at altitudes ranging from 715 miles (1,150 km) to 790 miles (1,275 km). From this height each satellite will be able to cover an area on the ground about around 1,300 miles (2,120 km) wide. The proposed SpaceX network would begin with the launch of about 800 satellites to expand internet access in the United States, including Puerto Rico and the U.S. Virgin Islands, the FCC filings showed. Internet access is the ability of individuals and organizations to connect to the Internet using computer terminals,or other devices.Today internet is popular among all nations.The speed of the interment is the main problem that some face.The Dissertation writing service helped me to identify some more topics related to this.So this mission with number of satellite will help to increase the speed of internet. Yeah I cannot honestly wait for that time with high speed internet. It will help me provide assignment writing help in a more efficient way as I will have a faster access to the internet. How are people gonna believe this? I think that they need to reviews from https://es.altomerge.com/reviews and then select it. It will help us all as it helping them too.